When we realized the blown-in fiberglass in the attic was getting down to the lower levels of the house we had moved into a tent in our backyard. We hired a crew to remove the fiberglass from our barn so we could live in the barn while we worked on removing all of the fiberglass from our house. The tent was set up at the pool deck. As I was sitting outside on the deck working on my laptop my lungs were aching. I could feel that same feeling of airborne fiberglass. I took note of the wind direction and began to walk around trying to figure out where it was coming from. I was led to the pool shed. That didn't make any sense. The pool shed was not insulated. That is when I noticed the roof. I walked closer. Wow, it was the roof! 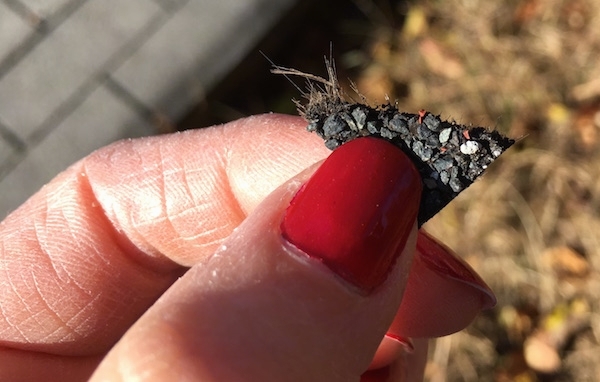 It was then that I discovered that most roof shingles contain glass fibers. As the shingle ages it flexes and curls and the tiny glass fragments shatter and float around the air. 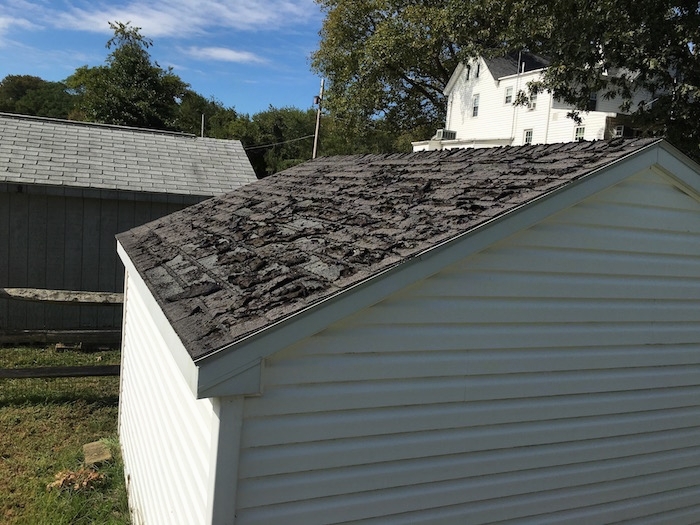 Even if you yourself keep your roof shingles new and in good shape, others do not. As you walk past these roofs or stand down wind you breathe in tiny pieces of glass deep into your lungs. Some of the fragments are so small they bypass the lungs and float around in a person’s bloodstream. Standing next to this roof was irritating my sinuses, nasal passages and lungs. 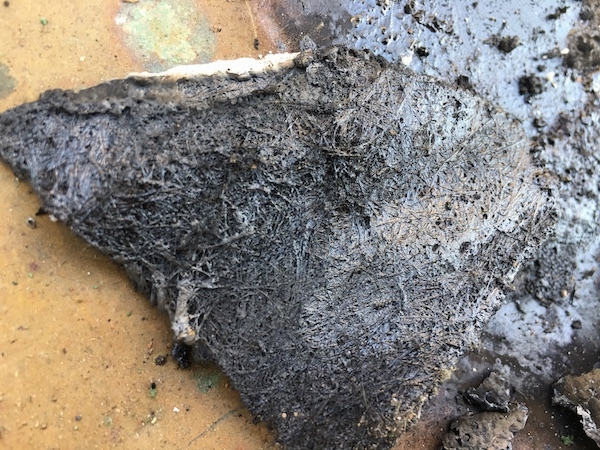 This is a curled roofs shingle from one of the roofs that was in the worst shape, which helped me figure out shingles are also a culprit of floating glass, because I could actually see the glass fibers in the worn shingle. 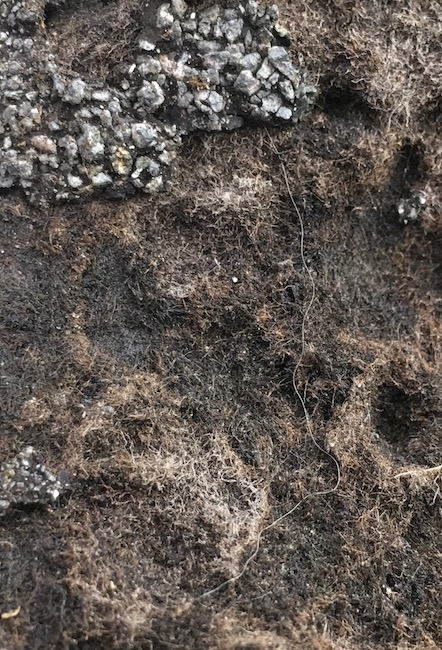 We have sheds and animal run-ins with shingle roofs that are in better shape than this and if I am down wind from them, they too make my lungs ache, which tells me they do not have to be this badly deteriorated before they become airborne. 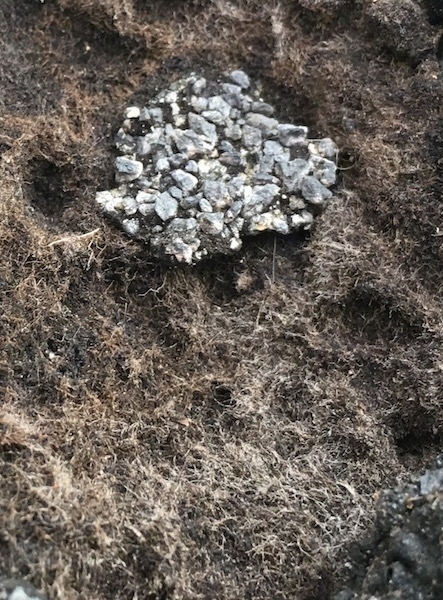 This is a close up view of a shingle that was located on the sunny side of the shed. The shingle wore out and you can now see the glass fibers showing through. 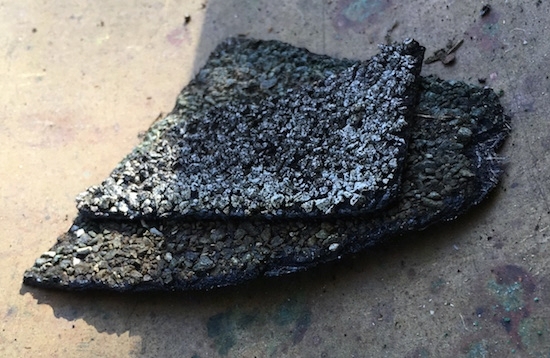 This is a roof shingle that burned in a fire. The only thing that is left is fiberglass. In the perspective of the shingle being flame retardant, it sounds like a good thing, but not the part where the tiny glass particles shatter and float round the air for everyone to breathe in. 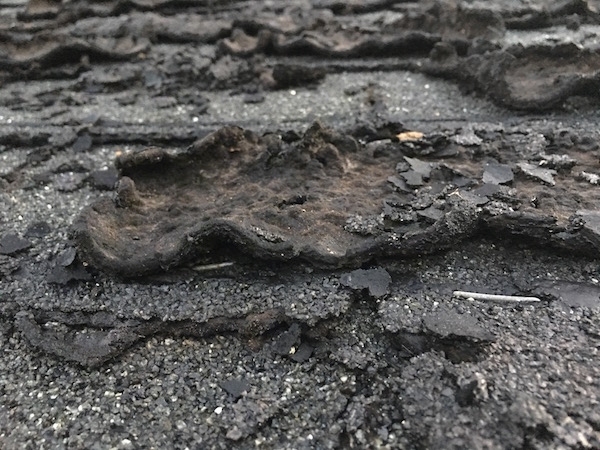 A worn out roof with warping shingles. 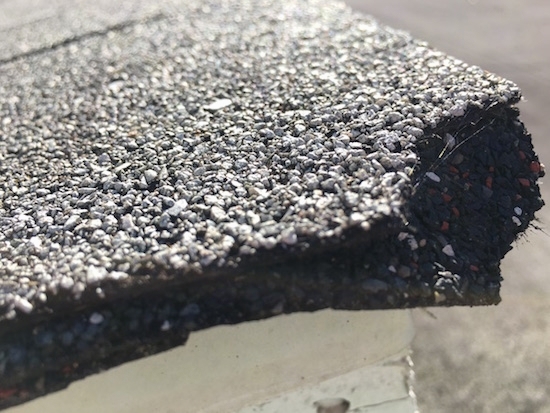 Close up of a roof shingle with the fiberglass showing. The glass that floats around the air is microscopic. After it shatters you cannot see it. All of the shingles on our property will be replaced with tin and other types of materials that do not become airborne. We are going to go as fiberglass-free as we can. While we cannot control the environment outside of our own property, we will do our best to keep the air quality as good as we can at our own home. We have quite a few sheds and barns on the property. The area around these three sheds would make my eyes watery with the feeling like they were open under water far too long in a chlorinated swimming pool, along with a stuffed up nose and numb skin. After removing the shingles the air in this general area felt a lot fresher. 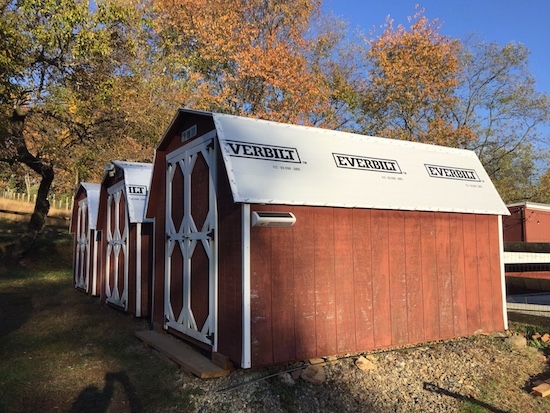 We are considering replacing the sheds with new ones that have a tin roof rather than putting new roofs on them. We will put tin roofs on the barns. A corner of a shingle that I ripped off in order to see if it contained fiberglass. Yes indeed, you can see the spun class poking out of it. The corner of the barn roof where the shingle was ripped from. ...and burned it with a blow torch to confirm what we saw coming out of the shingle was glass. You can see the glass that did not burn. What was left was a clump of glass. 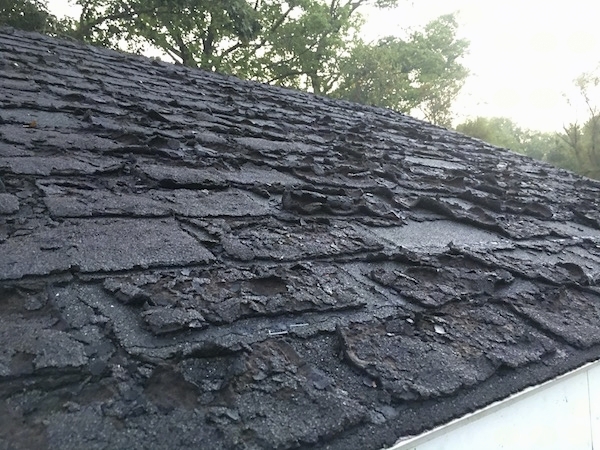 The test worked, confirming these are indeed fiberglass shingles but not without a price. Standing near it as it burned caused my sides to ache under both rib cages, numbed the skin on my face, made my eyes water and sting and made me feel dizzy and weak. I had to take a shower and change my clothes to make it go away. Yep, these shingles definitely need to go.